The incident took place at around 10 AM at the Mohan Nagar Metro Station on the Dilshad Garden – New Bus Adda corridor. All four injured were travelling by the auto crushed in the accident. 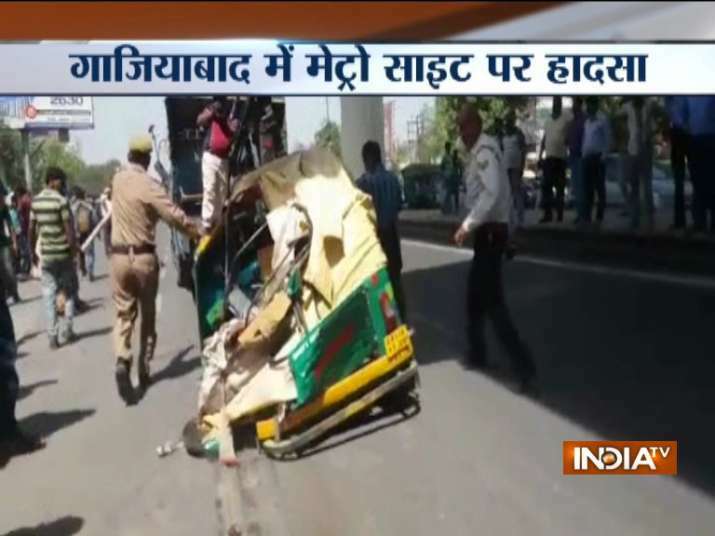 At least four people were injured in Uttar Pradesh' Ghaziabad after a steel girder from an under-construction foot overbridge at a metro station fell on a passing by auto rickshaw. The incident took place at around 10 AM at the Mohan Nagar Metro Station on the Dilshad Garden – New Bus Adda corridor. All four injured were travelling by the auto crushed in the accident. Injured have been admitted to Narendra Mohan Hospital. The Chief Project Manager and General Manager/Safety of DMRC have reached the site to take stock of the situation. The corporation yet to make an official statement. Earlier this year, the Delhi Metro made it to the Limca Book of Records for erecting 200 girders in one of its lines within a month, on the Noida - Greater Noida corridor. "This is the maximum number of U-girders ever launched in any Metro corridor in India within a month. DMRC used six special trailers to transport the girders and six special cranes," a DMRC statement said.